Hrmm, that's a great deal for Marvel shareholders. Buyouts occurring at the peak of a Primary 2....seems fitting. I'd also have to say that Marvel has just about wrung out every drop of $ they could with the comic book genre which, if you ask me, has pretty much "run the cycle" and is growing a bit tired .Four X-men movies, 2 Hulk movies (not even sequels mind you just the same story!) , Spidey x3, and even Iron Man. And I waited until Spidey 3 was on cable t.v. The Hulk movies I saw but the second was on cable t.v. So, I think Marvel made out marvelous on the deal, but I think Disney is going to regret this one. They blew a lot of cash on....hope. Hey maybe they make out in the long run but I got to say, they bought the peak and then some (paid a big premium for Marvel's shares). $4B is a lot of dough. It kind of reminds me of buying an "investment" property near the peak of the bubble - things look great (hey the house went up 50% in 3 years!) but once you have it, it turned out to be not such a nice buy after all. Just ask the Californians. But I'm sure Uncle Sam will bail out Disney down the road if they need a cash injection. 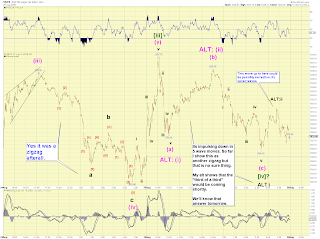 Another "contrived"-looking move. Huge gap move down in the a.m. and then the MM's held support all day with nary an attempt to challenge the gap down. Dip buyers. It reminded me of the pullback moves that recently took the market from 1018 to 978. I show these examples on the chart also. I'd have to say, the bearish stories were out in full force this morning. China was down 7% which the "newspeople" assume that weakness was going to flood into the US markets. So the bearish news stories were all over and "prepped" for the expected bearish month of September. And its not even September yet! So all in all the down move still seems convenient. But what I think doesn't matter. What do the waves say? 1) 1039 was the "top" and this is the beginning stages of P3. 2) The move down from 1039 was a (c) wave in an expanded flat that comprises all of Minute wave [iv] of Minor C up. I show this possible count on the chart. This means the market hasn't yet made its final peak. From the recent 1039 peak, it appears we have at least 3 waves down and today's sideways action could have been a wave 4 which means tomorrow the last wave 5 will play out with early weakness to a new low under 1014.62. In any case, that huge gap down today could be challenged and closed no matter what count we are in after the end of a 5 wave move from 1039 peak. 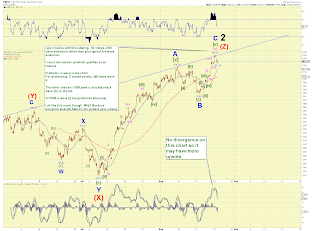 If the market explodes downward tomorrow, P3 is the count. That's about how I see it. 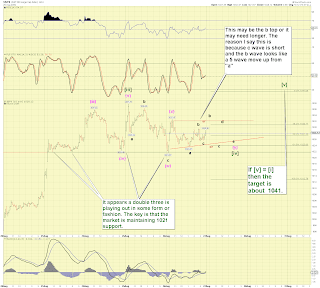 So far the Sunday night e-minis seems to be lining up with the ending diagonal scenario I shown on Friday's update. Since the 1014 low, it counts well as a bunch of "threes" both up and down as I have labeled. Well, got to get some sleep soon, we'll see what the overnight brings. 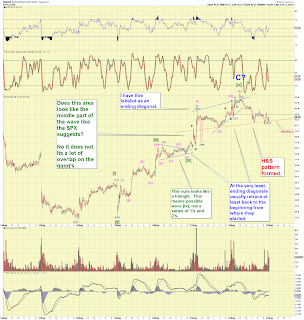 The price action of the past days/week have been whippy and waning. The market has experienced some nasty little selloffs lately and that reminds me of the sub-700 early March low but in the inverse. In March the selling exhausted itself and market bulls were practically nonexistent at 2% Daily Sentiment Reading (DSI). The current market has produced a distinct spike down on Friday much like the sub 700 SPX had a prominent 20 point spike up prior to making its final 666 low. In short, the market is sporting signs of exhaustion. DSI has been hovering in the upper 80's and nearing 90%. A possible ending pattern is an ending diagonal. I show that in my charts. (Nate also shows the a possible ED). It has a lot of merit and would be a logical place for one to occur. 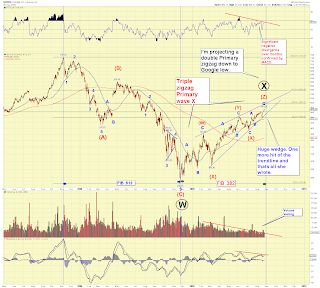 It will likely be messy to count, may be quick and the reversal down may be intense and unexpected. 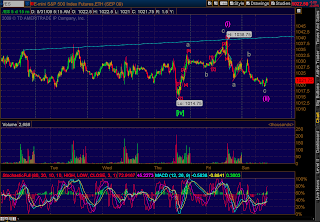 The intraday squiggles support the ending diagonal up move as they stand right now. 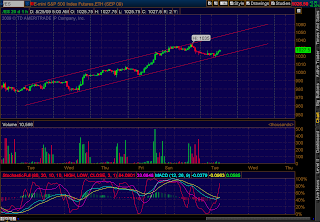 We have some obvious pivot points to watch and trendline support. Has the market topped already? I have a NASDAQ squiggle chart that may support that count. See Friday's midday update. We'll have to see how futures do Sunday night. 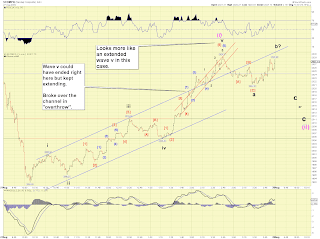 Option 1) If we were to count the waves as I have them in the NASDAQ charts, the market has topped. Just apply the same counts to the SPX and the SPX would have topped also. Option 2) If we were to assume that today's top is just a Minuette (iii) and we have one more push to go, then use the SPX count and apply it to the NASDAQ. Option 3) [Not shown] Todays top was just pink Minuette (i) of [v] and now a Minuette (ii) deep correction is occurring. That implies more upside after the Minuette (ii) finds its low and would run into next week to finish out the entire Minute [v]. This count would look funny because it seems a bit out of proportion perhaps with the rest of Minor C. But we have to include it in the realm of possibilities. Option 2 has problems in that black corrective wave ii and black corrective iv are essentially the same corrective. That violates the general rules of alternation within structures which is what gave me pause to try and come up with something different. So hence I made the NASDAQ take into account for this and made them part of differing degrees. I actually like the NASDAQ squiggle chart a lot. But I am a permabear so I may be biased that the top is in. However I do have good reasons for making it count that way at least! So be nimble out there. "The" top may be in. In any case I won't be posting this weekend or tonight because I'm taking a weekend trip out of town. However I'll be back Sunday night and will likely post an update then. 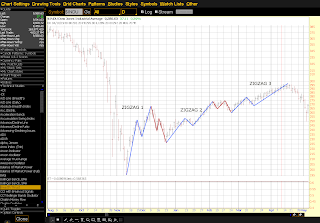 I have both the NASDAQ and SPX squiggles labeled as a Minuette (i) of [v] of C of (Z) of  top. The last wave v looks like it extended which would account for the overlapping waves in its structure. 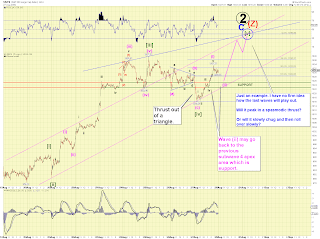 A retrace wave (ii) that hits support should be the launching point for a bullish wave (iii) up. Anyways, thats the count. Now lets see if the market cooperates. 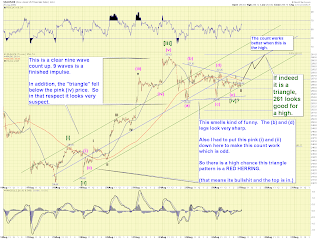 I am sticking with a triple Intermediate-sized zigzag rally for Priamry Wave 2. The uncanny resemblance to the 1930 rally in both time and price and form is uncanny. Of course I am predicting that what happened after the 1930 rally will also happen today. A relentless, persistent drop to unfathonable depths. End of Bear market = DOW less than 1000. Triangle indeed - except it broke downward heh. There was a typical "thrust" move out of the triangle. 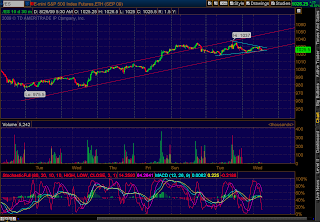 Support slipped a tiny bit at 1018 and recovered. 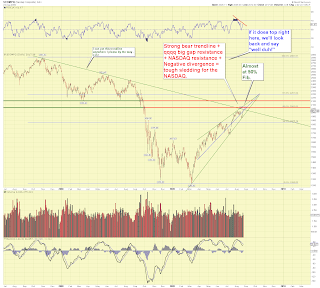 The thrust was just too much to produce more selling and dip buyers churned the market higher. 1) Do we have the degree labels correct? I must assume we do. It all counts well enough and "looks" correct. 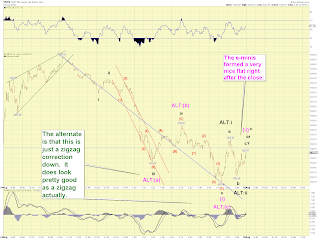 Indeed since Minor B was a shallow pullback, don't expect Minor C to run too far up. Bullishness supports the degree labels. 2) What are the targets? 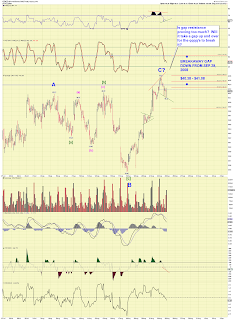 1048 is a good target. Its .618 Fib of (Y). 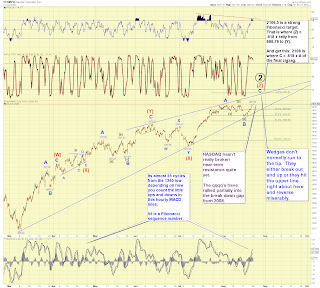 See the SPX daily. 3) Whats going on with the dollar? Its hard to tell. 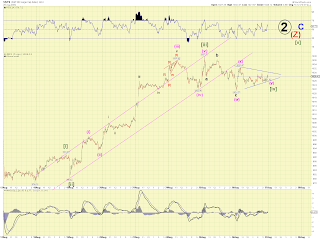 My best guess is that it may wind up an ending diagonal move for wave 5. What are some things we need to look for? 1) Up volume ratio. Bullish up volume ratio is okay as long as the day ends less than a 10-1 day. Any day that ends higher I would assume my degree labels are one degree too large for Minor C and that it will extend higher to a possible 1100 target or more. 3) How the market deals with the bear wedgeline if it makes it there. My general thoughts are that the market will top on Sep 1st much like it rushed out the gate in a bullish fashion on the first "full" trading day in 2008 in September. Then it sank like a stone. Triangle intact on the e-minis. Support has held. The (e) spot had a brief break under the [a]-[c] line but recovered. The hourly chart shows volume bars are much greater on the upside candles so far this A.M. All in all the cash SPX index could be making yet another attempt to head up and break out of the wedge upwards. But we kind of expected it having the primary count as a Minute [iv] correction. Yet the day could be very volatile either way. I expect higher total volume today no matter what happens. I have been thinking about what Erik said recently about P2 topping on the GDP reports for third quarter. I believe he was talking about a few weeks/months from now. However running across this tidbit got me thinking again about tomorrow's scheduled revised GDP numbers for Quarter 2. If they "surprise" announce that we actually ended the "recession" this past quarter, this could spark bullish futures (after a volatile whipsaw or two). Then the market would gap way up and hit its peak rather quickly and then you see a very big "sell-the-news" event indeed. Persistent. Dropping. Selling. Market finishes under 1000 for the day. And continues down for another week to 950. Then my shorts would be good. I can dream can't I? Of course the opposite --- some kind of freak extended wave [v] - could happen. But don't bet on it because most people invested in the market have likely already counted on "economic recovery" happening. Tomorrow's "good news" may only bring confused pain. The best thing the bulls can hope for is more bad news I guess. I don't really track news and announcements so if I got this wrong (if there is not a revised GDP report tomorrow), please excuse my error. PS - I have added more charts on my public lists - click on my blogroll link. http://stockcharts.com/def/servlet/Favorites.CServlet?obj=ID3271025 I am making an effort to "work" from these charts and leave them up. Feel free to vote if you like, it gets me free chart subscription time. Scroll down to the bottom of the chartlist to vote. You can vote once a day. PPS - Kenny is ahead of me on Google "followers", please follow me if you like to visit from time to time. At first glance, the DJUSFN looks like its sporting a wave [iv] triangle. And indeed I really cannot make a better count at the moment so no need to try and outguess it. But when you "zoom in" on the structure up from recent low 2 weeks ago, the top actually looks like it may be in and that the triangle is a "red herring" pattern and is a clever lie. 1) There are nine waves up. I had to put a pink (i) and (ii) in an odd place just to make a Minute [iv] triangle work. 2) There exists divergence with the general market. When the general market made new highs (1037 on SPX) on Tuesday, the financials did not. 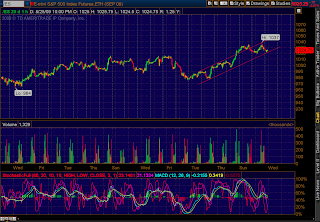 That is bearish divergence. 2) The Minute [iv] triangle has 2 waves that don't look right. 3) The move off the financial top could be a 5 down and sports a nasty dropoff. 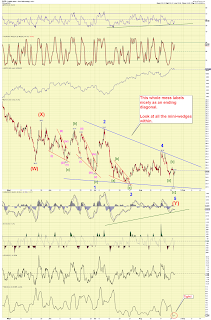 4) The Minute [iv] triangle dropped below the previous subwave (iv) low. That generally violates the principles of extended waves. So in conclusion, I'll show the Minute [iv] triangle because it would be silly for me not to. However I am not sure a new financial high will come even if a market high comes. It would be normal for financials to NOT make a new high at a major market top. It would help confirm bearish divergence between secondary indexes. Disclosure: I have a FAZ long position bought near the financial top. If it pushes higher I will add. The waves from the 1037 high looks like a complex set of zigzags. 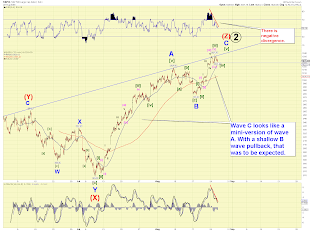 It counts well as a Minute wave [iv] correction so far. 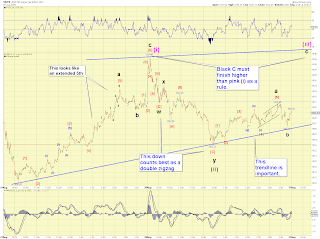 The entire correction is likely a form of a double three with a possible triangle forming as the last corrective three. I posted this pattern from 2 slightly differing perspectives. 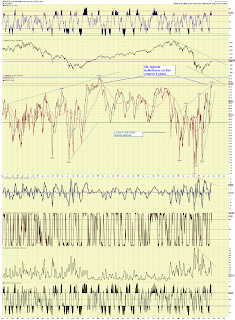 The 5 minute chart suggests the correction is virtually over and that the market will head to a new high early tomorrow. The 10 minute chart shows that the Minute [iv] could give a fakeout higher early and then fall back into more corrective waves finishing a long -winded triangle. 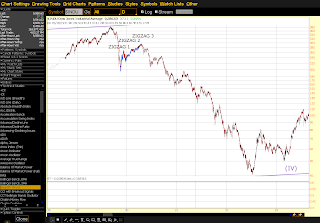 The peak of the market then would occur Friday at some point or even Monday, the last day of August. Regardless of what pattern plays and how long it takes, the key support is 1018-1021 zone. A break of this support is bearish. Formidable resistance exists at 1037-1044 and there are two heavy bear trendlines to match this area. The rising P2 wedgeline and the Great Bear line coming from October 2007 peak. In addition to the combined resistance forces, bullishness has now reached levels of October 2007 in a key market investor survey. http://www.marketwatch.com/story//investor-sentiment-index-reaches-late-07-levels-2009-08-26 This survey happens to be what EWI also tracks as a one of their major sentiment surveys. Taken all together, My hats off to the bulls who continue to buy at this stage of the rally. It takes big "kahunas". The price action does look bearish in a sense. The sudden drops and hard-down 5 wave structures (that I assume for now is just parts of 5-3-5 zigzags) reminds me of the sudden spasmodic rises that occurred sub-700 SPX. Not as extreme in the inverse but thats probably because bears have been long chased away from shorting this market. The CPC put/call ratio is also gyrating wildly and I seen a reading of 1.51 registered today. A lot of money is wanting to shift to the short side. I mean, really, Apple was back at $170. Even during its great runup to October 2007, it only hit $202. Its like good times again huh? Update 6am: Appears to be a triangle price action. Or subwave (i) and (ii) of [v] of C have played out. Same results either way - it all suggests one more push to a new high. Failure of this pattern is bad for the bulls. I'm willing to bend the channel to make the top of Minute [i] connect with perhaps a Minute [iii] (where 1937 top is) if thats the true wave count. 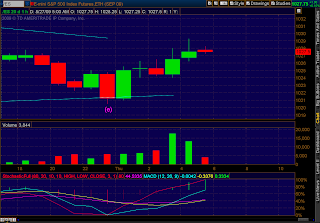 However look at the huge negative divergence on the MACD lines on the lower indicator. The new top today was not a healthy MACD rise. Momentum is waning. Its actually the worst negative divergence on this whole chart. I wouldn't be surprised to see the market drop nasty from here after the open. The nightly hours will probably see the stochs correct back up some more and if the prices don't get bullish real quick significantly with them, that will setup a possible bear move in the A.M. 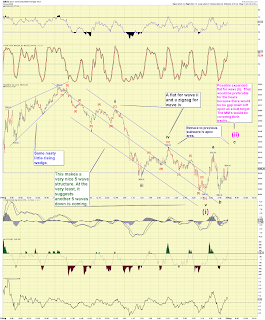 But negative divergences can be ignored for a while on a bull wave. But sooner or later that no longer works when everyone beccomes suddenly aware of the reality of the situation. I love combining the stochs and MACD lines on one indicator and then switch back and forth on different time frames to see where possible divergences are setting up. Its a great snapshot "visual" for me to look at quickly in the AM before I go to work. Unfortunately I do not have access to this platform at my work nor would I be able to view it even if I did. WE ARE UPGRADING GOOGLE (ticker: GOOG) to Buy from Source of Funds with a $550 price target, up from $400. We downgraded Google shares to Source of Funds on Feb. 17, 2009, based on our view that consensus estimates were too high and that low single-digit revenue growth in the second-quarter and third-quarter 2009 would cause significant multiple contraction. While we believe our fundamental thesis played out as we expected, we clearly got the stock wrong. Given that the second quarter is behind us and that we expect an "in-line" third ..."
These "analists" have balls. Downgraded when it was heading to a low, upgraded at the top. Its almost criminal if you ask me. When I constantly read crap (i.e.-pack of blatant lies) like this is a good indicator Google has reached a peak which it did hit my $475 target. Up volume ratio days over 10-1 are always noteworthy. You can see at the beginning of P2 there was a cluster. We have had less and less and they have gotten less powerful from the 48-1 day we had early in P2. So that is consistent with a fading rally as well as volume overall is not expanding. The CPC broke down low yesterday and this morning the put/call ratio was less than .50 I saw it clock in at .49 at one point this morning. I haven't seen that extreme reading since this bear market started. Yet the market painted a big gravestone type shooting star. And now it may face headwinds. The $BPSPX bullishness chart also registered a new high today. That is consistent with a possible top. You can see it also has the shape of a rising wedge. 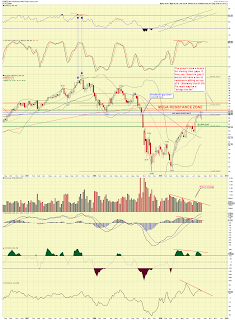 There are lots of index and indicators on many charts that sport the bearish rising wedge shape. 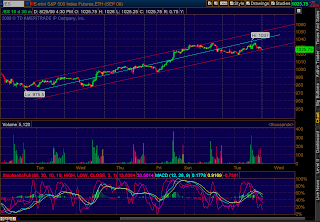 Even the RSI on the SPX sports a rising wedge. Its painted all over the place on many charts and many indicators. Finally, the DOW has the painted the biggest freaking head and shoulders I have ever seen. I have a parallel line with the neckline and its just about there if not already. Right Shoulder topped? I don't see how negative divergence would set in on the weekly if a new high is not made down the road. But sometimes the divergence flashes big time nonetheless even if it doesn't make a new high it is often obvious nonetheless. Yesterday I showed charts as if it was the P2 top. I admit is was a bit contrarian just in case because EWI and Kenny played it straight so I figured I might as well show a possible top count so all the bases are covered. But the alternate count played out today. So today I'll play it safe on the chart and show what could be one more possible move up to form the final Minute [v]. Roughly 1041 is the target. 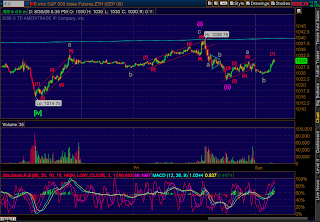 My alternate count has today as the P2 top of course and that the moves down are forming a series of 1's and 2's. 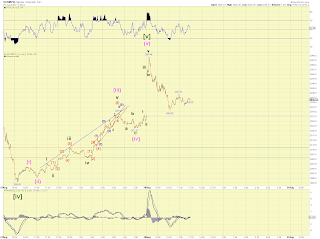 It was impulsing down in 5 wave moves intraday. So today may have been the top. We'll just have to see how tomorrow opens and plays out. Upper support must be maintained if there is going to be one more attempt at another peak. The whole area from 1035-1044 seems to be resistance. 1) Dollar chart is dangerously low. 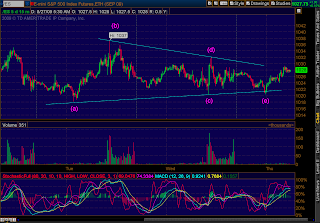 If its going to pulse upwards in a wave 3 move, it needs to do it soon. 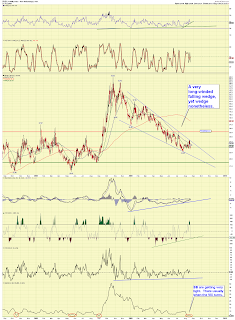 2) I show a nice count on the VIX. I have its low as ending at today's top. 3) The e-minis is about to break under their up channel from the 975 low. But that may not mean much as long as they stay sideways or above support. Another ominous SPX shooting star formed today. Bearish. Channel is intact. Good chance of making a new high again today. A break of 1020 support will likely send it tumbling to at least 1007. Good luck got to work today! "Mr. Emanuel said Mr. Obama will make the announcement from Martha's Vineyard Tuesday. He said the president credits Mr. Bernanke for "pulling the economy back from the brink of depression." Ummm, well lets see how the next few years goes bud before we make those kinds of pronouncements huh? I mean ok, maybe lets give the guy one more market squirt to a new high or two and then bring it all down. Or not. But from an irony and pyschological standpoint and a contrarian (EW) standpoint, I'd hate to be buying new longs at this point. I'm glad Benny is returning. He is a fun guy and I'd hate for him to go out such a "winner" like Alan-I'm-hiding-under-a-rock-Greenspan did. There really wasn't a clean break up for the qqqq's on Friday. I have the last waves as an ending diagonal. It looks pretty decent. The qqqq's have finally started to rally into their breakdown gap from last September 2008 after consolidating under it for many weeks. It won't be easy. Gaps like this are sometimes just gapped over by the MM's. I am not sure the qqqq's have it in them, its a big gap. I actually bought my first options today (finally got around to getting an option account approved rather than just a margin account). I didn't buy too much, just getting a taste for how it works and sticking my feet in the water. October out-of-the-money puts on AMZN (Amazon). It has an island at its $95 top. The puts increased in value a bit today. Overall P2 is always full of upside surprise and wiping out negative divergence or just ignoring it. P3 is all about downside surprise. We have yet to have real downside surprise just yet. Bah, EWI beat me to the punch on the DOW squiggles, but I worked hard on it and it pretty much mirrors my SPX squiggle chart in my update. The DOW squiggles are actually much nicer than the SPX and channel better. 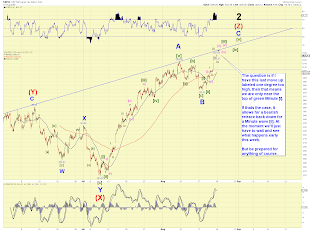 5 waves down means, at the very least, there should be another 5 wave move coming. It would be nice if tomorrow wasn't a gap down, that way the bulls would have no "targets" to keep rallying. What I don't like is EWI shows the squiggles as 5 waves down from today's peak yet they show only Minuette (iii) topping today which means another 5 wave move down actually would kill their structure because wave (iv) would potentially trace lower than makes sense. 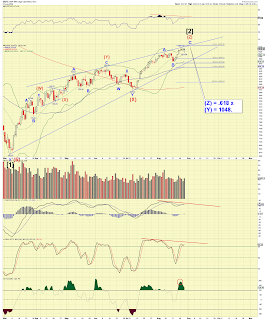 An extended third wave, should have all the sub wave 4's tracing higher than the previous subwave 4's. Thats what makes it an extended wave! If we have another 5 waves down, then this simple principle will likely be violated and the bears will be shooting for Friday's gap up as a target. That's why I took the other approach of labeling the 9 waves up from 978 as a finished impulse with the wedge ending move. Well that could be P2's top. If not, we are getting close (at least in price). All my charts here assume the P2 top is in. The obvious alternates are listed. 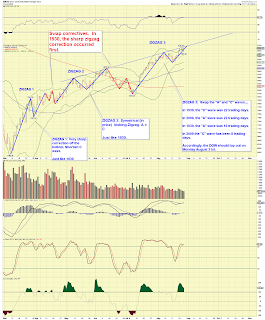 Many charts and stocks look like they are finished with either big 5 wave moves up (see my bank chart below). So based on this, why would I assume P2 will continue to march onward? It did hit my preliminary target range of 1032 - 1044. Ok raise your hands out there, how many feel this is not the P2 top? Most of you raised your hands? Well maybe then its time. 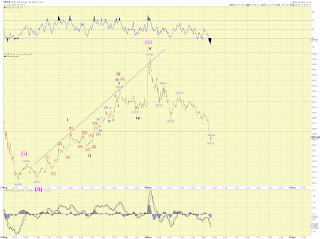 I cannot ignore the big negative divergence on the daily RSI. An awesome 5 wave structure. 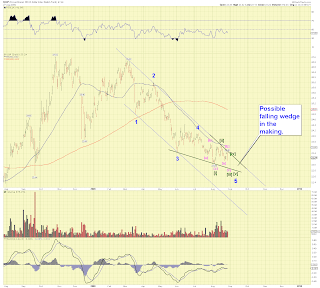 By EW guidelines, it should correct down toward the previous wave 4 price area. Of course if its the top, it'll correct way more than that. I'll keep this chart on my public list. You can access it from my blogroll listing. I count nine waves up. One possibility is a P2 top. So I labeled the chart as if it was the top. It did hit my P2 target range of 1032-1044. It would be an unassuming ending wouldn't it? However it may only be Minute [i] top. Or Perhaps Minute [iv] is playing out and p2 will peak a bit higher later this week. One thing for sure is that I think there is more risk vs reward holding longs overnight versus shorts. The VIX has been hammered since the October 2008 peak. A giant falling wedge. It "appears" to be ready for a trend change soon enough. The VIX is diverging with the indexes. 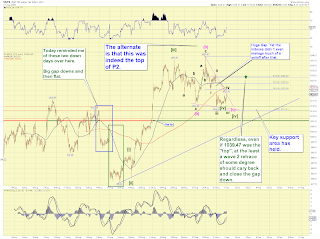 Indexes made a new high and VIX did not make a new low. 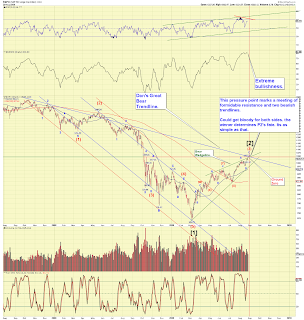 This can go on of course for a bit longer until your broke but it does show that the "fear" correction is waning. The VIX took about 54 weeks to advance to peak VIX (October 2008) when referencing from the October 2007 market price high. From that "fear" (panic) high point in the VIX, it has taken about 34 weeks to correct to the 23.00 VIX low of a few weeks ago. 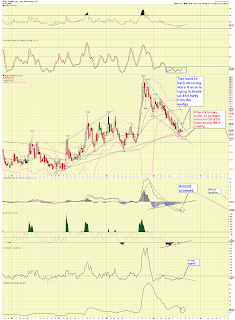 That represents about a .618/.382 Fibonacci time relationship between the VIX advance and the VIX retreat. I don't necessarily think this is some "proof", I am just trying to make a point that its been quite awhile now since true panic has been in the marketplace. In conclusion, P2 has been rallying officially in price less than 6 months. 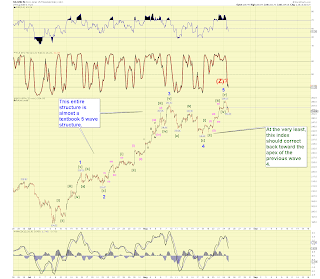 However "fear" has been correcting for some 9-10 months. Which brings me to "Black Swan" events. Wikipedia describes http://en.wikipedia.org/wiki/Black_swan_theory#Identifying_a_Black_Swan_Event Black Swan Theory as "high-impact, hard-to-predict, and rare events beyond the realm of normal expectations". For the stock market, that equates to a major market crash in one short period of time - ala 1987. They say these type events are impossible to predict yet if your an Elliottician at least you can calculate the "best chance" of them happening - and that would be inside a Primary  wave of a cycle wave c of a Supercycle wave (a) of a Grand Supercyle wave [IV]. And the best spot inside P3 would be a "third of a third". When and if that moment comes, then that would be a maximum panic point. Could P3 be kicked off with a "mini" Black Swan event? Could P3 kick off with, say, the DOW dropping 400-500 points in one day out of the "blue" based on whatever the news of the day is? I would argue yes it could! Its one reason I won't chase the long side at this point (hold long overnight) even if the market rallies to SPX1130. So I miss out on 100 points! Big deal! At least I can sleep easier at night. I'd rather think that P3 has a decent chance of kicking off with more a "bang" then some slow-rolling top that many are used to seeing. It doesn't have to be a big bang, but don't count on the market allowing you to see it roll over in a nice easy fashion. The NASDAQ represents the leading edge of speculative $$$ just like the Chinese markets. There is a good chance this index tops out first and produces intra-market divergence if the SPX and DOW continue to make new highs after a NASDAQ high. Its just something to look for. 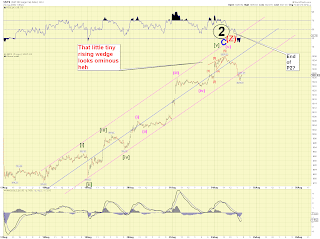 Its also the only index of the three that actually hit the lower wedge line on this recent Minor B wave pullback. 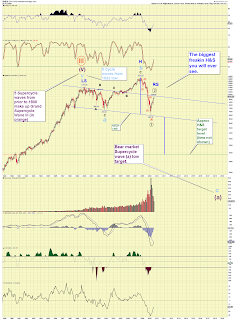 So what is a solid target for the NASDAQ? Well incredibly a very solid Fibonacci confluence exists at 2106.5-2108. 2106.5 is where Intermediate red (Z) = .618 times the rise from the March low to intermediate (Y). 2108 is where blue Minor wave "C" = .618 times blue Minor "A" within the final (Z) zigzag. Over 2100 would also mean the NASDAQ had retraced in price over a Fibonnaci 50% (would be about 52%) creating a very satisfying Primary wave . This spot also happens to correlate pretty well where the upper wedgeline would be hit by the NASDAQ again. Since the qqqq's (which track the $NDX or NASDAQ100) drive a majority of the NASDAQ, looking at the weekly qqqq's chart shows that they have started to finally rally into their breakdown gap from 2008. They have a knack for closing gaps. However even if it closes that gap, you can see there is a ton of overhead resistance still sitting on the qqqq's. Basically anyone who bought the qqqq's over the last 2 years and held may be glad to see the qqqq's back at this price and may just determine that, hey, its time to get out. The SPX chart poses one important question: Do I have the degree markings correct for this breakout move over 1018? If I do, then that means P2 top is not too far off in both price and time. If however the market is only rallying on an initial Minute wave [i] of [v] of C of (Z), then the SPX may run higher and longer than I have suggested on my provided chart. It would also allow a retrace Minute wave [ii] that could retrace any amount between 978 and Friday's high. Mondays are usually a continuation of Fridays so they say, so we have no reason just yet to see a bearish Minute [ii] retrace. One noteworthy item on the daily SPX chart (not shown - see my public list on Stockcharts.com) is the extreme negative divergence that exists on the RSI. This is the kind of divergence that marks major tops, not Minute [ii] pullbacks. If of course the market continues to trudge upwards on Monday some of this divergence will be likely erased which I half expect. 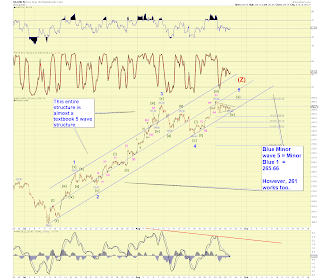 However it will be hard for the market to erase it all if and when the SPX peaks. The other important question is what if this is just a finishing move of a long-winded Minor "A" wave? I don't favor this as being the case because it doesn't fit well either in the sub-wave count or technically. I rather think this is indeed the final C wave to P2 peak playing out. A shallow B wave retrace may just indicate that C wave will be a rather quick, stunted affair. Bullishness on the $BPSPX is at a new extreme (81.20). The CPC (see Friday update) has really reached a new low level. A final push will make the trade so one-sided, that the markets will have nowhere else to go but down. Going back to the NASDAQ, I'm also looking for a potential "exhaustion" gap up to occur for the qqqq's to break through their 2008 breakdown gap. That would occur likely Monday if it was to play out that way. Maybe that even creates a weekly island top for the qqqq's. Those are some of my thoughts at the moment. Its things I am keeping an eye on and we'll just have to see how the market plays its hand during this final low-volume week of the summer. Every index has made a new high. 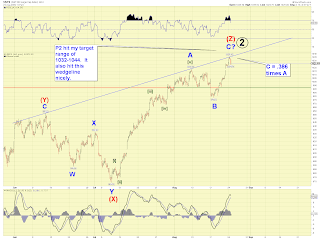 So by Elliott Wave guidelines, P2 could be very well over at any time. 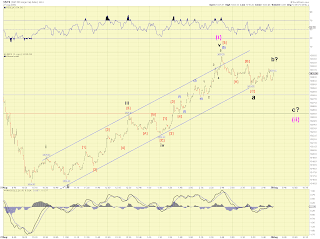 Did Minor B Wave Happen Weeks Ago? "A Financial Collapse is Not going to Happen"